To find out more about Scripts and automation within the Mnova Suite visit our scripts section. This dialog includes all the processing and analysis features implemented in Mnova. You can choose the required options by selecting the check boxes and, if necessary, specify options by clicking the button ; next to the corresponding command. 3. Once you are happy with the result, save the script file to a Mnova Processing file (*.mnp) by clicking on the save button in the dialog box. 4. 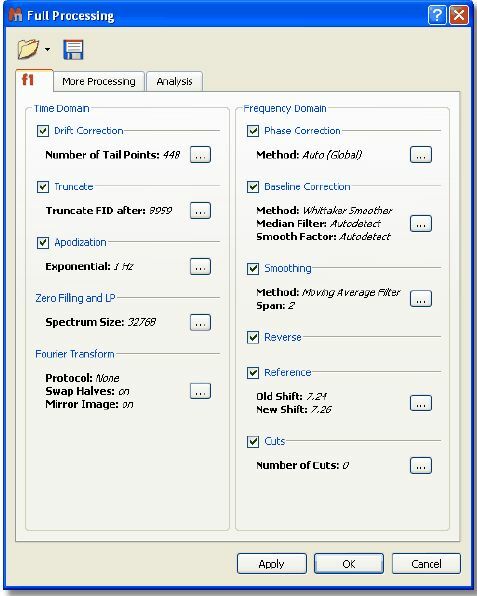 You can now apply this processing script file to any other spectrum/spectra by selecting the spectra you wish to proc Processing Template dialog box. 1. If you want to apply a processing script to all the spectra opened in one document, first select all the spectra in all the pages. 2. 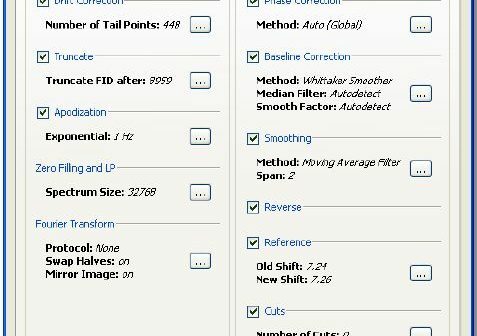 Next you can simply go to Processing/Recent Full Processing and select the appropriate processing file script. 3. Remember that only spectra acquired using the same conditions should be processed using a processing script file. For example, if you have acquired a spectrum using a sequential mode and another one using simultaneous quadrature detection, you will get erroneous results.